Can you confirm these amateur observations of Sitana ponticeriana? Type locality: “Indes orientales”, restricted to “Ponidcherry” by SMITH 1935. Types Lectotype: MNHN-RA 6901 (designated by Amarasinghe et al. 2014), paratype: MNHN-RA 6902. Diagnosis Diagnosis (genus). Small to medium-sized lizards, male SVL 36.6-56.6 mm, females 36.4-52.1 mm; head- scales unequal, strongly keeled; supraciliary edge sharp; fourth toe extending well beyond third, fifth toe absent; exposed tympanum, no preanal or femoral pores, no prominent dorsal crest; presence of en- larged scales on the lateral side of the trunk and a single enlarged keeled scale on the thigh region. Scales on the dorsum within the dark brown line marking are relatively larger than the adjoining smaller scales on the lateral side of the body. Dewlap size varies from small to large depending on the spe- cies. Sitana can be differentiated from their closest living genus Otocryptis by the absence of fifth toe and an exposed tympanum (Deepak et al. 2016: 85). Variation: Dewlap color is very variable in this species with coloured-fanned, intermediate-fanned, and white-fanned males. Diagnosis (adult males): Sitana ponticeriana differs from all congeners by having the following characters: S. bahiri sp. nov.: snout longer ES 61.5–68.1% of HW (vs. shorter, ES 54.7–57.4% of HW), throat-fan longer ADW 31.1–54.7% of AG (vs. shorter, ADW 28.3–29.2% of AG), femur longer FEL 80.0–84.8% of TBL (vs. shorter, 70.6–75.3% of TBL), ventral scales 65–69 (vs. 87–89), breeding-males with bright red colour patch (vs. bleached orange colour patch); S. devakai sp. nov.: femur longer FEL 80.0–84.8% of TBL (vs. shorter, FEL 72.2–78.4% of TBL), ventral scales 65–69 (vs. 100–108), abdominal scales rounded (vs. pointed); S. deccanensis: smaller SVL 48.0–49.0 mm (vs. larger SVL above 60.0 mm), snout longer ES 61.5–68.1% of HW (vs. shorter, ES 53.1–53.4% of HW), throat-fan shorter ADW 31.1–54.7% of AG (vs. longer, ADW 50.3–60.2% of AG), foot longer FOL 150.9–175.5% of HL (vs. shorter, FOL 131.9–144.6% of HL), supralabials 8–10 (vs. 12), midbody scale rows 66–70 (vs. 50–54), ventral scales 65–69 (vs. 82–92), enlarged scales above the tympanum present (vs. absent), unequal and irregular lateral scales with intermediate enlarged scales (vs. equal and regular lateral scales without enlarged scales), breeding-males with bright red colour patch restricted to mid throat-fan (vs. bright red patch extending to vent); Sitana sivalensis complex: throat-fan extending up to the abdomen (vs. not extending to the level of the axilla), foot longer FOL 150.9–175.5% of HL (vs. shorter, FOL 120.0–144.3% of HL) [Amarasinghe et al. 2014]. Diagnosis. 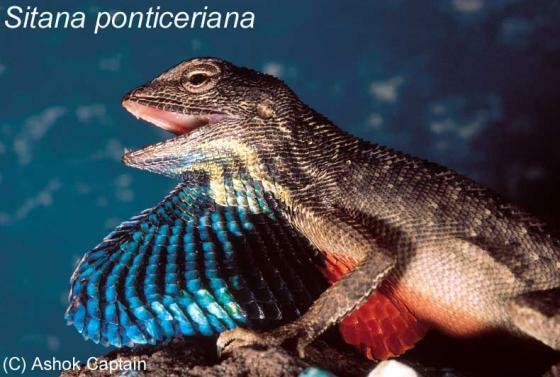 Sitana ponticeriana can be distinguished from all the members of Sitana spinaecephalus clade in having a strongly serrated dewlap with extensive blue colouration and a large orange spot vs a weakly serrated dewlap with only a single blue line (Fig. 3 & 9A). Sitana ponticeriana can be easily distinguished from the three species in Sitana sivalensis complex by having a dewlap that extends posteriorly beyond the forearm insertion. Sitana ponticeriana can be distinguished from Sitana visiri sp. nov. in having a proportionally smaller dewlap that only extends up to 46% of the trunk length vs up to 56%. 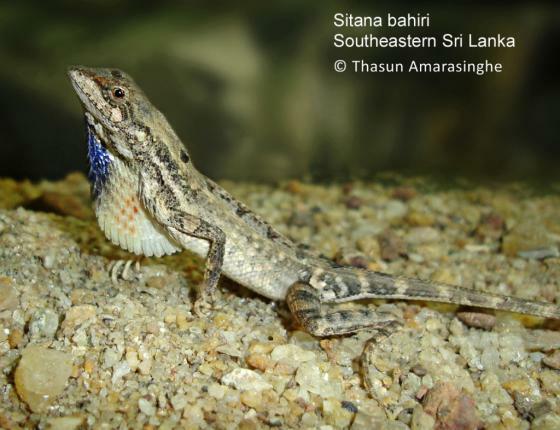 Sitana ponticeriana can be differentiated from the other members of the S. ponticeriana Clade, Sitana devakai and Sitana bahiri, in having a dewlap that extends far posteriorly along the trunk (up to 46% vs 29% and 33%, respectively). 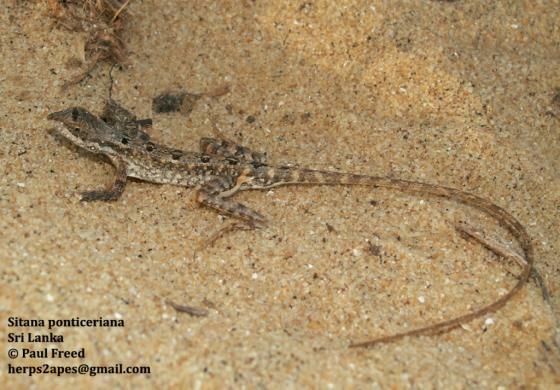 Sitana ponticeriana are medium-sized lizards; males (40.5 ± 2.5), females (41.8 ± 4.6). Details on morphometric data, scale counts and body ratios of select characters for multiple samples are given in Table 3, 7 and 8. The dewlap is large, extending posteriorly up to 46% of the length of the trunk (Deepak et al. 2016: 87). Diagnosis (bahiri, adult males): Sitana bahiri sp. nov. differs from all congeners by having the following characters: S. devakai sp. nov. (see below): shorter throat-fan ADW 28.3–29.2% of AG (vs. long, ADW 29.9–32.5% of AG), midbody scale number 49–56 (vs. 57–59), ventral scale number 87–89 (vs. 100–108), abdominal scales bluntly pointed (vs. pointed), unequal and irregular lateral scales with intermediate enlarged scales (vs. equal and regular lateral scales with intermediate enlarged scales), breeding-males with bleached orange colour patch (vs. bright red colour patch); S. deccanensis: smaller SVL 40.0–50.0 mm (vs. large SVL, above 60.0 mm), longer snout ES 54.7–57.4% of HW (vs. shorter, ES 53.1–53.4% of HW), shorter throat-fan ADW 28.3–29.2% of AG (vs. longer, ADW 50.3–60.2% of AG), shorter femur FEL 70.6–75.3% of TBL (vs. longer, FEL 79.7–82.9% of TBL), longer foot FOL 158.9–159.8 of HL (vs. shorter, FOL 131.9–144.6% of HL), supralabial number 7–8 (vs. 12), midbody scale number 49–56 (vs. 66–70), subdigital lamellae number on toe III 14–17 (vs. 13), subdigital lamellae number on toe IV 23–26 (vs. 19–23), enlarged scales above the tympanum present (vs. absent), unequal and irregular lateral scales with intermediate enlarged scales (vs. equal and regular lateral scales without enlarged scales), breeding-males with bleached orange colour patch (vs. bright red patch extending to vent), a single pale stripe from snout up to the shoulder (vs. 3–4 bright stripes from snout and behind the eye up to the shoulders); S. ponticeriana: snout shorter ES 54.7–57.4% of HW (vs. longer, ES 61.5–68.1% of HW), throat- fan shorter ADW 28.3–29.2% of AG (vs. longer, ADW 31.1–54.7% of AG), femur shorter FEL 70.6–75.3% of TBL (vs. longer, FEL 80.0–84.8% of TBL), number of ventral scales 87–89 (vs. 65–69), breeding-males with bleached orange colour patch (vs. bright red colour patch); Sitana sivalensis complex: throat-fan extending up to the chest (vs. not extending to the level of the axilla), foot longer FOL 158.9–159.8 of HL (vs. shorter, FOL 120.0–144.3% of HL). Comment Distribution: Not confirmed from Pakistan (KHAN, pers. comm.). Specimens from Maharashtra and Karnataka may be S. deccanensis. Synonymy mostly after WERMUTH 1967. Sitana deccanensis JERDON 1870 was revalidated by Amarasinghe et al. 2014. There is some doubt surrounding the taxon Sitana ponticeriana mucronata Deraniyagala, 1957. Its type is lost and no live populations have been found since its original description; therefore, we here consider this trinomen as a nomen dubium. Bahir & Silva (2005) argued that S. p. mucronata could refer to a misidentified Otocryptis wiegmanni Wagler, 1830 (fide Amarasinghe et al. 2014). Sitana bahiri was synonymized with S. ponticeriana by Deepak et al. 2018. Type species: Sitana ponticeriana CUVIER 1829 is the type species of the genus Sitana CUVIER 1829. Etymology Cuvier (1829) in his description did not mention anything about the generic name. Jerdon (1853) mentioned that Sitana is the name that it was known by at Puducherry, with the genus name a Latin termination of the word “Shaitan” or Devil. Jerdon also notes that the name was sometimes applied to it by the Musulmans of South India. More recently Schleich and Kästle (2002), without any reference, suggested that the generic name is derived from the Tamil language sit wona, small lizard. Sit wona does not translate to small lizard in Tamil: it is either siri- yawona or chinnawona. There is no mention about the etymology of the genus by past herpetologists (Günther, 1864, Boulenger, 1890, Smith, 1935). Since Jerdon’s information was published during the same century, we suggest his version of the genus etymology is more likely to be accurate (Deepak et al. 2016: 85). Etymology (bahiri). The species epithet is an eponym Latinised in the genitive singular, honouring Mohomed Mujythaba Bahir for his generous friendship, and remarkable contributions to Sri Lankan herpetology, carcinology and biodiversity conservation. Currently he spends his valuable time promoting science, biodiversity and conservation to the general public, especially the younger generation. Schleich, H. H. & W. KÄSTLE. 1998. Studies on the morphology of Sitana sivalensis spec. nov. and Sitana ponticeriana Cuvier, 1829. In: Contributions to the herpetology of south-Asia (Nepal, India). pp: 101-120. H. H. Schleich & W. Kästle (Eds). Fuhlrott-Museum, Wuppertal.